College has begun again, and between juggling a part-time job and full-time college while volunteering on a student games project, I haven’t had the time to prepare with Phaser as intended. On top of that, I’ll be having family over this weekend to visit, so the weekend won’t be free. I likely won’t participate this time, but I’m determined to catch the next one. Meanwhile, I’ll put the time to continue working on a micro HTML5 engine for the js13kGames jam. I did some hobby game development several years ago, then just… stopped (lack of motivation, I suppose). Looking back at some of the stuff I’ve done, even incomplete LD projects, I marvel at what I accomplished and wonder if I could even repeat that. I’ve wanted to continue for a long time and have beaten myself up every time I let a LD or a OGAM pass me by… but here’s my chance to get back into it. I’d like to hear any suggestions between Phaser.io or LÖVE from people with some experience. I presume that LÖVE makes for easier distribution (though I do have webspace for hosting, if I want) and that they’re comparable in actual flexibility/power (which is to say: both very good), but I’m open to biased preferences and hearing why. My intended idea at the beginning of the jam proved too difficult to complete. Then I had pretty much no ideas for the remainder of the compo period. Finally, just when the compo period ended yesterday, I had an idea for playing a bossfight from the boss’s perspective. The connection to the theme is pretty weak. You only have one… eye? Room? Goal? Regardless, even though the game only barely touches the theme, is buggy, has no sound, has very unfinished graphics, and has incomplete gameplay implementation, I’m just glad to have something, even a very rough prototype, to show for the Dare. I’d have felt worse if I simply hadn’t been able to come up with anything at all and had had to skip over this jam. Whatever one can say about Cyclops, it was a good learning experience. After I’ve had a break to cool down from this jam stuff, I’d like to return to the prototype and polish it to completion, just for the experience of it. So, my idea was a bust; I bit off more than I could chew. While my game concept was feasible within the compo period, I didn’t have enough knowledge to actually see it through in that time. I spent almost all day today just trying to get collision detection to work, and I have no clue about enemy pathfinding or a number of other critical parts. I’ll be bringing the protototype to completion outside of the LD, just for the sake of the practice. As for the LD, if I can come up with a decent game concept within the limited time left, I’ll try to race something out. To those who know: what’s the difference between the compo and the jam? I really haven’t gotten much done in the 3-4 hours I’ve been working on things so far (not counting the couple of hours it took to settle on an idea). I decided on a top-down Zelda-style adventure game that incorporates the “You Only Have One” theme with the player having only one weapon: a magical staff. In order to overcome obstacles or attack/defend against enemies that have various magical powers, the player will need to set the combination of elemental magic that their one tool–the staff–will be giving out. For instance, the common situation of encountering a fire enemy. The player may switch to water or ice magic to attack with, or switch the staff to fire magic and block with it, preventing the player from taking the elemental fire damage. This will be a big learning experience for me, since I haven’t ever made an action game before, even one as simple as a Zelda-style adventure game. Presently, I only have the controls (which currently require a gamepad, like that of an Xbox 360) implemented to select the elemental magics, as well as a life/magic bar in the form of blue pips that circle the center. I’ll get into the meat of this project tomorrow. Well, here’s me saying that I’ll be participating. This isn’t my first Ludum Dare, but it’s my first one (not counting the last mini-dare) that is actually on a modern system. Here’s hoping I can come up with something good with the theme. Fingers crossed! I don’t have much artistic experience to speak of. Doing even pixel-art sprites are very difficult for me because I lack a history of drawing. My only sprite experience has been with extremely limited sprites on the Atari 2600, which are practically colored outlines more than full-on sprites. Tonight, I’ve experimented with a style similar to Superbrothers: Sword ‘n Sworcery, which I absolutely adore. Since it’s very pixel-by-pixel, the level of detail and accuracy in sprites like Shovel Knight isn’t necessary, and I appreciate its use of implied detail and the focus on animation while letting the viewer use their imaginations to some degree. I’ll probably be shooting for a style similar to this for the upcoming Ludum Dare, unless my idea (whatever it is) just isn’t appropriate for it. I suppose I have to start somewhere. If anyone knows of any good tutorials for newbies to learn drawing/pixel art, I’d love it if you’d share them! Just at in the eleventh hour, I managed to finish off building a version of Heartbreak that should scale nicely for all Android devices. If you have an Android device, please give the .apk a try. I’d love to hear how it plays for others on their phones, or even tablets. I also added in a little easter egg for those with tappy fingers. Well, v0.1 is complete, anyway. Considering how much stuff I had in mind when I began this LD which didn’t come to fruition, I hesitate to call it a full-fledged 1.0, but it’s working, and (as far as I can tell) stable. I’m pleased with the final result, overall. It could definitely use some polishing and expanding, but for two and a half days spent making what is essentially my first non-2600 game? It could certainly have been worse! My only real disappointment is that I don’t know how to dynamically make the game fit across multiple mobile device screens. The linked version is sized for a Droid RAZR HD, since that’s the phone I’ve got. Once I figure out how to make a version that scales automatically for different phone resolutions, I’ll make sure to post it. Until then, give the Windows version a shot if you don’t have a RAZR. Controls are mouse clicks and drags, since it’s the same control scheme as the tapping/flicking gestures of the mobile version. For those curious, you can play the original game, made for the 2013 Game Jam in Unity3D, here, and my remake for the Atari 2600 (included in a compilation ROM of other small games I made) here. The latter will need an emulator such as Stella. This has been an excellent learning experience. I’m going to enjoy a little break, but then I hope to keep working on learning more to improve what I can do, whether with programming, art design, or sound design, since there is serious room for improvement in all of them. First off, to anyone reading this–when exactly does today’s LD end? Is it at a specific time, or just midnight, relative to whomever is doing the dare? Last day. I’m fortunate that my game happens to be significantly less complicated than everyone else’s, so I have the luxury of effectively being finished, then having an entire day to polish things up. The downside is that I’ve decently recreated everything that I’d intended, so I’m not quite sure on what direction to go with said polishing, aside from the inclusion of music and sound effects. I suppose that’s part of the learning experience. I expect that I’ll just use the sound effects created for the Atari 2600 version, since they’ll be simple to acquire and appropriate for the retro-inspired style I had intended. UPDATE: I’ve got some sound effects in, most of them simply recorded from the 2600 version of Heartbreak, though I generated a couple with DrPetter’s awesome SFXr, made for LudumDare participants, as it so happens. The sounds that I chose aren’t particularly great, but sound engineering is something I have zero experience in. May be a field worth learning more about for the future, particularly if I intend to keep participating in dares like this. This took the longest. I’ve been working on the title/credits screens for half the day. My desire to make things as “neat” as possible has resulted in an absolute mess of code all over the place as the entire game only uses three rooms, one that only initializes two variables before kicking the player to the title screen, and one that just scrolls credits on screen, since it seemed easier to use a unique room than to modify an existing room. The remaining room handles all levels and the title screen based on what global.level is set to. It’s both elegant, and an absolute mess. This went off fairly well, especially since the songs I’m using from incompetech.com list the BPMs of the songs, making it a lot easier to make them feel integrated. In hindsight, there is a song for the last three levels of the game that may be almost unfairly fast, which causes the heartbeat to be nearly too quick to get the color you want, so you have to anticipate it. Ah, well–I’m sure that anyone who can make it to that level will be able to handle it. UPDATE: After some research, it seems that most of the effects like noise or scanlines are done using surfaces, which I know nothing about. I’ll definitely be looking into them in the future, but since I’m on a deadline with this LD, I think I’ll stick with the crisp, clean style that I’ve currently got. Besides, I have a couple other ideas on how I may polish things. I’m very pleased with where things are right now. Considering that much of yesterday was spent with family after Thanksgiving, I got started late today, and I took frequent, long breaks, I couldn’t be happier that the core game is basically completed after about 12 hours or so of actual work. It’s good to know that the game could be made and work well within a Game Jam’s time period, no problem. Take that, guys who said that Heartbreak couldn’t be made in GameMaker! I’ve been keeping an ongoing list of my progress throughout the day, and I feel that having the work in a checklist aided in my productivity and concentration. I’ll have to practice this sort of thing more in the future. That leaves things like sound effects and music for tomorrow, but at least those should be fairly simple to do. There is an abundance of great music available on the ‘net, and I may simply record my sound effects from the Atari 2600 version of Heartbreak to use again, as they are perfectly serviceable and I would be looking for something similarly retro-synth-sounding, anyway. I’d also like to experiment with different visual styles, such as a grungy pixel art look and/or some scanlines. Something so that the visuals are so overly smooth and clean. That said, I do like the pastel colors that I’ve settled on, and it all looks pretty slick on my phone. I’ll have to experiment tomorrow and see what I like. In any case, I consider the mini-LD technically complete as of now, since the gameplay is implemented and fully functional. The only nagging point is a crashing bug that I experienced a few times that I’ve been unable to replicate and track down. Here’s hoping that it got smoothed out somewhere and doesn’t rear its ugly head. Or, if it does rear its ugly head, hopefully it rears it high enough that I can find the neck and give it a good chop. That’s it for me tonight. Time to wind down! P.S. Is it just me, or does the above screenshot have a bit of an optical illusion going on with the blue block on the far right? Try turning your head back and forth and looking at it out of the corner of your eye. To me, it’s like the blue block separates away from the rest of the circle. After a relaxing night’s sleep, some Thanksgiving leftovers, and a couple YouTube videos to wake up with, I’m back to work! While checking the new posts for this mini-LD, I came across this particular post, which posted a video about motivation. Now, I, personally, often have trouble keeping myself motivated. I tend to want to go do something else, like watching YouTube videos, playing a game, chatting on Skype, etc. and it’s been a bane to my productivity for many years. In the interest of giving the aforementioned video’s suggestions a try, I’m going to set out a clear list of things that I must get done today and organize them into “modules” so I can see the progress I’ve made. I’ll be editing this post to update my list as I work. Mostly complete, and much simpler than expected, thanks GM’s point_direction function. Still need to test it on a mobile device with someone to see how intuitive the controls are. Update: Complete, with press-dragging to move the blocks and tapping to create balls or change ball colors, if a ball already exists on the playfield. It’s actually very intuitive on a mobile device, which is pleasing. This was one of the shorter, simpler tasks. 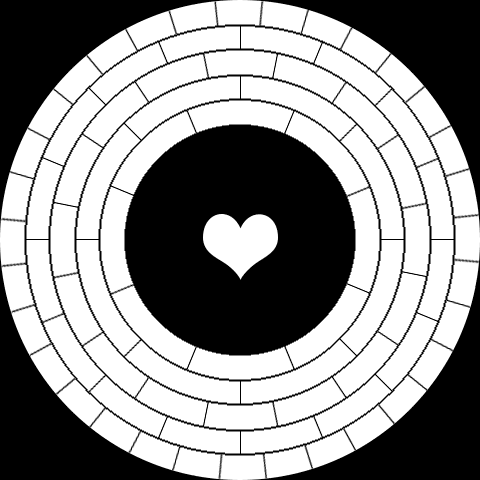 The heart is resized based on a global lives variable and is destroyed when the lives are set to 0, which also serves to lock out any controls but a simple tap, which resets the stage. I underestimated the work involved in “Bouncing Ball,” so I’ve split it into two categories, now. Collisions work, with balls correctly changing the colors of the blocks they hit, but I don’t have any bouncing code implemented as of yet. It may prove to be complicated, and I’m not exactly sure how I will implement it. I’ll ponder it while I take a break. Finally managed to get this implemented. Not only did decent bouncing take a while (and it could use some work, but it’s serviceable), but I came across a number of other things that needed tweaking and fixing in the process. There’s still one bug that I can’t reliably replicate that strikes almost at random, seemingly only when a blue ball hits an orange block, but only on occasion. I hate loose ends. This task was fairly simple, and I took advantage of GM’s defaulting unspecified array values to 0 to my advantage to cut down a tad on how huge the level array will be, at least in code. Now to type out the levels, which should be fairly simple–it’s just a bunch of copy-pasta. There are currently 22 levels implemented, with plenty of room for more. My level system is pretty flexible, allowing me to specify how many rings there are (I’ve set up the rings in a switch case statement so that they’re rendered in a certain order), which colors the heart progresses to (a necessary control for the earlier tutorial levels), and what the odds are of each of the eight possible colors spawning. It worked out quite well, and I could easily add more levels that have different color spawning odds, but I’ll probably leave it at 22. The current score is rendered on-screen, just above the heart, as in the original Unity3D version of the game. I had to look up how to make it always display zeroes to the left of the score, but in hindsight, it’s something I should have figured out, myself. Time to put on a game soundtrack and get to it. On a related note, while Hotline Miami has an awesome soundtrack in the game itself, it doesn’t make for good listening on its own. FTL and Super Meat Boy are great to just listen to, though. If you can think of some others, let me know. Well, I think that it’s gone well so far. Using the template posted earlier, I built base sprites for each row of blocks, then created a script for creating and setting up individual blocks and a script to churn out full rows. Much like the original game(s), I hope that this version will do a decent job of teaching intuitively through level progression. Also, the heart changes colors and has a simple beating animation (just scaling down for a frame). Tomorrow, I’ll be adding the ball and controls. If I have time (which I expect I will), I’ll also add in all the core levels and the score counter. There should be at least 12 levels, each of which will introduce something new (an additional color or another row), plus a few different random mixtures for infinite play beyond that. Here is a screenshot of where I’m at so far, with all the blocks being randomized into place. Seeing how it looks, I’m definitely going to have to figure out something different visually. I was shooting for something cleaner, but it just looks drab in the end, plus the blocks don’t fit together particularly well, so I will have to rethink that. Maybe a pixel-y art style will be back on the table, since it’s relatively simple to accomplish, but would add some visual grit and variety, if done well, so everything wouldn’t seem so bland. Time for a break, then bed. The core of Heartbreak is the blocks that get colored and rotated. Thankfully, GameMaker should make this relatively simple, since it has a coloring function that I’ve tested and find to be working fine, plus a simple rotation value for each sprite. All I need to do is create a single block, give it an offset that will make it rotate around the center of the screen, and then rotate and color the blocks based off of a controller object. I’ve already had some annoyances with selecting a resolution, so I’m just going to keep it simple (since I don’t have much time or experience for fiddling around with adjusting views for every possible mobile device) and just design it for my own Motorolla RAZOR HD phone, which seems to have a 1280×720 screen. If only there was some semblance of a standard when it comes to phone resolutions. This is certainly giving me a whole new respect for mobile developers, who have to contend with multiple versions of images for all possible densities and resolutions of phones, and they are all over the place. A question I now have to ponder is how many blocks to design the game for? I have a couple templates made, one with 80 blocks and one with 40 blocks. The Atari 2600 version of Heartbreak used 16 blocks in a row, but that would mean 80 blocks after 5 rows and I wonder if that wouldn’t just be too tedious to play through. I suppose I can always adjust things later, if need be. What bothers me is that 8 blocks seems good for the inner-most two circles, but since the individual blocks in the rings get larger and larger, that makes the outermost ring quite easy. I suppose I could combine rings of 8 and 16 blocks, either with the inner-most two or three rings sporting 8 while the outer ones have 16, or maybe just a random combination of 8 and 16? The latter would be a bit more tricky to program, as leaving things purely to random chance could result in too many or too few blocks in a row. I’ll have to see how things go. EDIT: Using different sizes for the rings gives 64 blocks total, a nice in-between, and requires more and more precision for the player, so I think that I will go with it this way. Last journal post until I actually make some progress, I swear! After making a long post about my choice in game engines and then another explaining where my original game concept came from, I’m going to, finally, explain the history of my first game’s development. In brief, I hope. As you can probably see, the game is very flawed. One major issue was with the controls, which were tied to the mouse, so moving the mouse left and right caused the ring to spin. Hitting left mouse button would fire the balls from the central heart. On top of that, the game itself is bugged. At the eleventh hour, we discovered a bug on the fourth or fifth level that would cause the score to reset to 0 after the player had progressed to the following level. Finally, at the time I made a big deal out of “elegance of design”, which I saw as every part of a game coming together to compliment everything else. Don’t get me wrong–elegance of design is a good thing, but I may have taken it a bit too far by creating a menu system that you could literally “lose” at (by accidentally selecting the exit button), in the interest of turning even the menu screen into a gameplay tutorial. I think I had seen one too many episodes of Sequelitis. After the 2013 Game Jam, I was excited to try my hand at game programming, since I’d been only the lead designer for the original Heartbreak. I wanted to learn the craft of programming for myself, in the interest of being more self-sufficient. To that end, I decided to start as “simple” as possible and got into programming for the Atari 2600. Yes, the real Atari 2600. If it’s a bit debatable whether or not I technically “made” Heartbreak version 1, since I was really just directing a Unity 3D programmer in what to do, I consider my actual first game to be my first remake of Heartbreak for the Atari 2600. I used the homebrew tool Visual Batari Basic, which, when combined with Batari Basic, gave me a convenient and simple IDE with many helpful sprite and sound design tools, plus the ability to code in BASIC and use a pre-made kernel, rather than coding everything directly in 6502 Assembly. I was extremely grateful for that. It took me a couple months to actually make Heartbreak for the 2600, since I was learning along the way and frequently had to go back and reprogram bits of code here and there as I discovered more efficient ways to organize the game logic. Keep in mind this was all done for a system with a 1.19Mhz processor and 128 bytes (yes, individual bytes) of memory (only 26 bytes of which were available to me in Batari Basic, since the kernel I used consumed the rest of it to write the playfield to the screen). In the end, it was again thanks to a more experienced programmer, who generously wrote a custom kernel for me, that Heartbreak was able to function well on the 2600. Normally, using Batari Basic’s standard kernel, only a single playfield color can be displayed on-screen per playfield pixel (those big, rectangular blocks), but the programmer managed to work around that limitation with some clever 6502 Assembly wizardry that I still don’t fully comprehend. From the custom kernel as a framework, I was able to build the finished game. Some months later, I revisited my old code and cleaned it up, organizing everything into neat, clean functions that you can view here. I’m rather proud of how tidy and efficient it all is (relatively, keeping in mind that this is BASIC with 6502 Assembly calls in it, all programmed in non-object oriented in a language that relies on spaghetti code). The game itself only uses about 1000 out of ~3000 CPU cycles that are available with this particular kernel, and the game itself is under 4 kilobytes. And, yes, it works on a real Atari 2600. If you’d like to try for yourself, I included Heartbreak, with a few other small games I developed for the Atari 2600, in a 32k compilation ROM (along with an updated version of my previous LD, Ping) that you can get here (you’ll need an emulator such as Stella to run it, unless you have a real 2600 with a Harmony cartridge), and you can see the finished version of the game below. There have been a number of gameplay changes since the Unity3D and earlier 2600 versions. Originally, the player had to hit a button (joystick fire on the 2600, spacebar or left mouse on Windows) to fire a new ball from the heart. 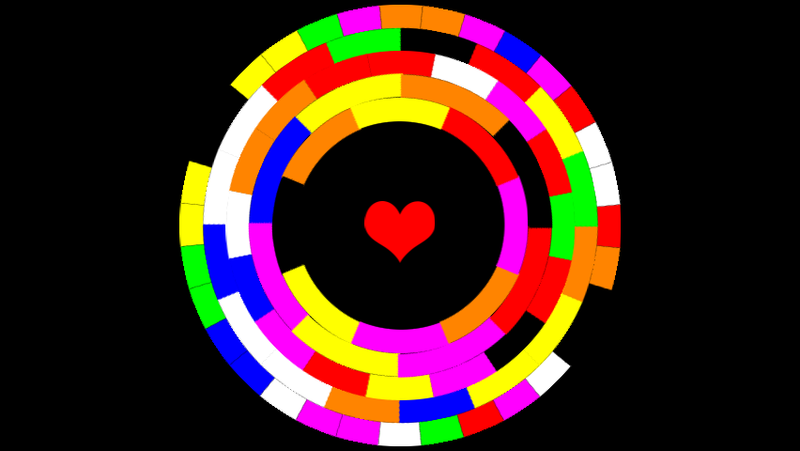 The ball would take on the color of the heart and it had to either match the block’s primary color or be one of the primary colors that made up the block’s color, or else the player would lose a life (indicated by the size of the central heart). Hitting a wrong block three times meant game over, but the player’s heart would be brought back up to full size after every stage. Once I’d finished the basic game on the 2600, I was seeking to program in alternative gameplay modes, since alternate modes were a thing with many 2600 games. One of those modes included a bouncing ball, so rather than the player having to spawn each ball (which would fire from the heart and then disappear once it had stricken a block), the player only had to press the fire button when they wanted to transfer the heart’s current color to the ball. This meant a lot less button mashing, and it was far more satisfying to just control the blocks to catch the ball as it bounced. This ended up being the only game mode in later versions. With the block colors, I’d always intended the game to start with simple primaries–Red, Yellow, and Blue, and work up to secondaries–Orange, Green, and Purple–and finally to White and Black. White blocks would give you a heart back, but black would take away a heart if they were struck and had to be avoided, which was particularly challenging in the 2600 version, because the background is solid black as well. However, this lead to the game becoming progressively easier, since an orange block could be broken by either a red or a yellow ball, a green with yellow or blue, and a purple with red or blue. Obviously, a game should get more challenging over time, not less. I fixed this in the 2600 version by having the ball remove a color from the block’s color, leaving the remaining colors in its wake. For instance, if a red ball hits an orange block, it bounces off and leaves a yellow block behind, which must then be broken by a yellow ball. And if the orange block was hit by a yellow ball, it would bounce off leaving the block red. Yellow blocks would need to be hit by all three primary colors before they would disappear. Overall, I’m very pleased with how the game itself plays as of the final 2600 version, but a few things had to be sacrificed in the move to the 2600’s limited hardware. For one, the ball will only bounce at a few pre-determined angles, as letting it bounce freely would result in the ball always getting lost, particularly since the blocks aren’t of uniform shape and they don’t fully encircle the central heart. Additionally, there was no way to add multiple concentric circles to the game, so it always operates on a single ring. I would very much like the game to have up to three or four rings at a time, as in the original Unity3D version. Finally, I always intended the game to be a musical arcade game, but having background music wasn’t feasible with the 4 kilobyte size limit of the 2600’s ROM. I would like to bring a musical quality back into the game, with the heartbeat matching the tempo of the current soundtrack, rather than set to a steady, heart-beating sound effect. On top of all that, I’d also like to bring the game to a mobile setting, which I think would fit the gameplay very well, being a sort of casual game that works best in just a few moments played at a time. This would, of course, mean reconsidering the control scheme. I would like a simple swipe gesture to allow the ring to spin, perhaps with a simple tap used to set the ball’s current color to the color displayed by the heart. 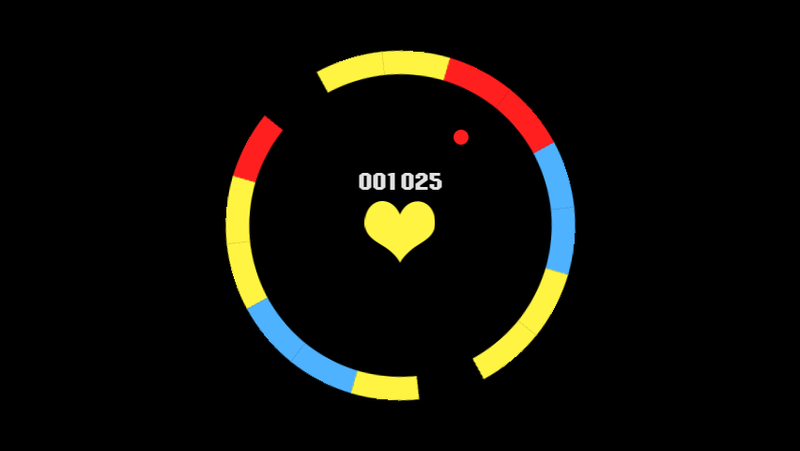 On the other hand, I may modify that mechanic so that the heart does not change colors on its own, but instead must be tapped by the player in order to change the ball’s color. Or maybe the heart and ball always share the same color and, rather than tapping at the right moment to get the right color on the ball, the player would need to tap the heart to swap between its colors? We’ll see. While I’m at it, I’d like to update the game’s visual style, maybe moving away from the direct pixel-art look into something a bit cleaner. And, who knows–if I find the time, maybe I’ll try implementing some kind of power-up system, similar to Arkanoid. I may have an idea of how it could work. Now it’s (finally) time to get to started! As mentioned in my previous journal entry, I will be remaking my first game, Heartbreak. It’s a bit of a strange tale, however, since Heartbreak wasn’t originally “made” by me at all, at least in the sense of programming. It was my baby design-wise and in the limited capacity of “art,” but I relied on another programmer to do all the actual creation. Still, I think that it will count fine for the sake of this mini-Dare. It’s either that, or Ping. The game was originally made for the 2013 Game Jam (the same one that produced Surgeon Simulator 2013). It was my first time ever attempting to make a game, and I was nervous of the possibility of having no ideas. There were about 200 students packed into a lecture hall (which very much surprised me, as our university isn’t particularly large) when we were all given the theme for the Game Jam: the sound of a beating heart. We broke off into 15-20 person groups and went into separate classrooms to brainstorm. This was my first experience with brainstorming, and I loved it. There were dozens of great ideas thrown around, my contribution being an idea for a point and click adventure game set inside a dystopian, film-noir crumbling city that was located in someone’s body, with a large, pulsating heart looming in the background. It was supposed to be a story about survival and dealing with impeding death, etc. Not a very good idea for a 3-day game jam. Then, someone in our brainstorming group suggested a game consisting of a number of arcade-style mini-games. Although I cannot guess why, for some reason Heartbreak–a mix-up of the classic arcade game Breakout where the player controls the blocks instead of a ball, with the blocks arranged in a circle around a beating heart that serves as the player’s life counter–sprung immediately to mind. I abandoned the over-complicated concept of a point-and-click adventure game and clung to this new concept. When we returned to the lecture hall and game creators began separating to work on individual games, I found myself almost working alone, since my concept of an arcade game about moving colorful blocks around a heart sprite didn’t quite grab attention in the same way that some of the other concepts did, but I managed to hook a couple people who claimed to be experienced with programming in GameMaker. With that, we all broke up again into different classrooms to begin constructing the games we’d gone with. My group was, by far, the smallest, with most groups having 6 to 10 people on a team, and I with just 3. The two programmers set to work surfing the Internet and half-heartedly (forgive the pun) looking up tutorials while I fiddled with some sprite art and designed the game in my head. That’s how most of the first evening was spent–simply thinking while I worked. By the next day, after a short sleep and a lot of fitful half-awakedness, the game, simple as it was, was fully-formed in my mind. The only remaining problem was that the two programmers claimed that the concept couldn’t be done in GameMaker (something I intend to prove wrong during this mini-LD), and so our little team was stalled for a few hours until a very nice and quite talented Unity3D programmer stepped in to join our group and get us on the right track. Said programmer made the game in Unity entirely on his own, with me hovering over his shoulder like a fussy mother, directing every aspect of the game’s design. To cut an already too-long story short, our little four-person team (the two GM programmers were delegated to sound work, which meant searching Newgrounds for some music tracks and finding a few arcade-like sound effects) ended up winning “best designed game” for the Game Jam at our university, as well as “most popular” among all those students at our university who participated. A humble honor that was all thanks to the nice programmer who stepped in to make the game for me. It fired off a brand new interest in game development that I’d not really had before, and I’m still waiting to see exactly how far it will take me. 21 queries executed in 0.115 seconds.